Forecast and technical analysis EURUSD on February 05, 2019. On Monday the 4th of February, trading on the euro closed down. In the US session, the dollar made gains against all the majors on the back of a rise in US10Y bond yields. Traders and investors clearly took positives from the US jobs report on Friday. Growth on the dollar was tempered, however, by disappointing figures for US factory orders. Factory orders fell by 0.6% in November against a forecasted rise of 0.3%. Since this data was for November, the reaction to it was relatively weak. The euro subsequently dropped to 1.1424. 11:50 France: Markit services PMI (Jan). 11:55 Germany: Markit services PMI (Jan). 12:00 Eurozone: Markit services PMI (Jan). 12:30 UK: Markit services PMI (Jan). 13:00 Eurozone: retail sales (Dec). 16:30 Canada: imports (Dec), exports (Dec). 17:45 US: Markit services PMI (Jan). 18:00 US: ISM non-manufacturing PMI (Jan). My expectations of a rebound from 1.1454 followed by a breakout of the support were met. The 45th degree was broken through, but the pair fell short of the target of 67 degrees. The pair is currently correcting upwards without any substantial trading volume, so I’m keeping my target at the 67th degree (1.1408). 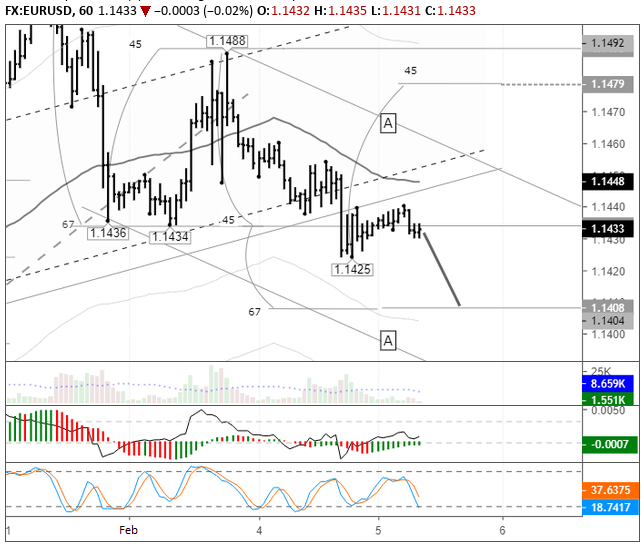 On the lower line of the A-A channel, the target is at 1.1370. The stochastic may now interfere with this, as it is currently is the buy zone. This won’t be much of a factor, however, as oscillators don’t work against the trend. With a strong movement, it will stay in the zone below 20% and stay there until we get a price reversal. The indicators are all lagging and so aren’t currently predicting anything. All they’re doing is showing us the current state of the market. The only leading indicator is the tick data for supply and demand.